On Friday, Tanzania celebrated its 49th birthday. I spent the day in Tanga, the third biggest city in Tanzania, a humid city at the coast of the Indian ocean. Tanga was known as one of the industrial centers of the country, but experienced a break-down from which it never recovered. I was not able to discover any enthusiasm, any special event nor any parade dedicated to the anniversary. Yes, some people were gathering around TVs to watch the big parade in Dar es Salaam, headed by President Jakaya Kikwete. However, such gatherings would also take place when a popular show would run on TV and for sure many more people would be around when an English Premier league match would have been shown. Tanzania celebrates on 26 April the union of Tanganyika and Zanzibar which was sealed in 1964. 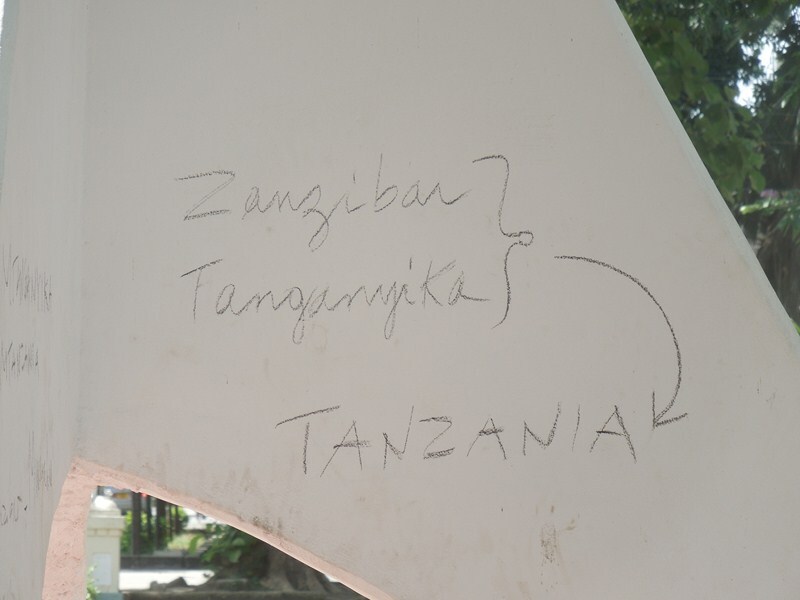 Tanganyika already got its independence in 1961 while Zanzibar received its freedom in December 1963. Only thanks to a coup d’état against the Sultan of Zanzibar, the Republic of Zanzibar and Pemba was created only to be united shortly afterwards with Tanganyika. This move was possible thanks to the efforts of “Mwalimu” Julius Nyerere, Tanganyika’s Prime Minister at the time and the first Tanzanian president. This pan-African hero worked closely together with Abeid Amani Karume, the president of Zanzibar. In fact, the United Republic of Tanzania has been celebrated as an exemplary model for pan-Africanism. In fact, one will not find many cases across the globe where two independent countries have voluntarily united to become one – and it actually worked, in contrast to attempt to create the Ghana Guinea Mali Union. However, Tanzania is neither a unitary state nor a federation because the founding fathers decided to choose a two-government system with the union government managing the mainland while the Zanzibaris have their own government in place. Now, as the country is discussing a new constitution (which is more than necessary to get finally rid of the current document! ), some anti-unionists in Zanzibar hope to alter the union and get even more autonomy and eventually even independence. These times of harmony have changed since quite a while, if they have been there in the first place. In short, many people in Zanzibar are not satisfied with the union. There is a widespread feeling of being neglected by the mainland. While Zanzibar is a tourism magnet, the perception prevails Zanzibaris don’t get as much back as they should. Contested elections in October 2000 led to a massacre in January 2001 when the army and police shot into the crowds of protestors killing at least 35 and wounding more than 600. In 2005, nine people were killed when CUF supporters felt that their victory was taken away from them from the ruling CCM party. Recently, three riots organized by an independence movement in 2012, the killings of two policemen in October 2012 and increased religious tensions have shaken the union, as a priest was shot in Zanzibar in February 2013. Yet, the current challenges that on the surface are often interpreted on religious grounds might be much more related to political exclusion and socio-economic marginalization. That is why the Tanzanian government finally has to resolve the problematic issues in the union. Overall, I have got the impression so far living in this country for some five months that the union of Tanganyika and Zanzibar is on a surprisingly shaky ground. It is something one doesn’t hear often about in the west. After all the pomp that was present in National Stadium on Friday, President Kikwete would be well-advised to improve the livelihood of people in Zanzibar. However, the same expectation and the same failure to do so is experienced on the mainland… Thus, there is not much to expect. If anything, the debate with the new constitution might make it ever more difficult May the unity continue – but clearly it will be necessary to rebuild the basis for a prosperous future. Article Reblogged by http://www.southweb.org Blogging around!